Happy Christmas to all blog readers and of course to all rehab horses and their owners, past, present and future! Before you all start tucking into the mince pies and brandy butter there is just time for an update on Wales. He arrived with extremely weak feet but as you can see although there is a lot still to do he has made some good changes. His foot is more upright and less under-run and his long toe is slowly coming back. One of the biggest challenges with Wales has been the central sulcus splits which as you can see are still a problem. Although I am treating them daily we have had incredibly wet weather which I am sure has slowed up the healing process. However he is able to land heel first on both front feet now and that is one of the most important ways to promote better frog health. The damage to his sole at the toe in this photo is something which has occurred in the last few days and is a bit of a mystery. He was a bit tender on it initially but seems to be steadily getting better again now. You can see the split clearly from this angle but despite that this is a foot which is improving and the palmar hoof and digital cushion are clearly better than they were. This was his lamest foot and again its good to be able to see positive changes even though he has a way to go. Wales' New Year resolution should certainly be to deal with these splits and keep his palmar hoof heading in the right direction! Unfortunately my camera battery conked out on me before I finished taking all Brandy's photo updates but here are the ones I managed to grab. The difference is particularly clear when you look at his foot from the caudal view where the improved digital cushion is visible. I am going to post updates on all the rehab horses over the next few days as they will all have been here for 8 weeks by the time we get to a few days after Christmas. Tabby was the only one who came in shoes and as I posted in her previous update its ironic that the shoes were intended for support. In fact her foot is far better supported out of shoes, as you can see if you study the back of her foot and how much less under-run it is now. Similarly the shoes and pads actually restricted the function of her frog and heels and made them weaker. This photo shows her foot straight out of shoes and when you compare it to the same foot today, below, its clear how much more structure there now is at the back of her foot. This is still a foot in need of lots of time and mileage but the developments which are happening now would not have occurred were she still shod. The right foot is also in better condition now than it was in shoes. This foot has also dramatically improved over the last 8 weeks as it has had to start working for a living again. The asymmetry is interesting but not surprising and will change further as her foot continues to grow. Better structure in the back of the foot with less distortion in the hairline as well. Updates on the others to follow! Of course the joy of having horses barefoot is that they are just as sure-footed as normal on the snow so we had a good morning out exercising in sparkling, crisp conditions. Who knows whether we will get more snow this winter but it made a spectacular and welcome change from the rain and gales we had yesterday! 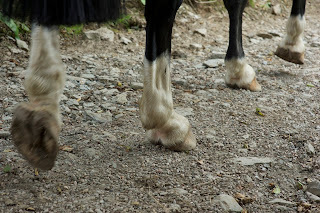 I know its a while till the New Year but it will be upon us pretty soon and now that "Performance Hoof" is finally out there I was wondering if there would be any interest in me running some hoof workshops in the New Year? I have a lot of people emailing me wanting advice on specific horses and in all honesty its not possible to give sensible advice from a photo or even a video but a workshop with real horses and real owners would be a totally different matter. The idea would be to look at both the environment as a whole and at the individual horses and try to come up with some tailor-made ways of improving hoof health and performance. We could film horses moving, as I do here, and assess how they are landing and loading their feet and what could be improved or strengthened. Looking at nutrition is always a vial part of any hoof health programme so that would be another important area to look at, along with what sorts of ridden and in-hand exercise might be most beneficial for the horse. I'd be happy to travel and run workshops (probably for a whole day) at people's own yards as long as there were enough people interested and enough horses to give us some variety. If you are interested in setting up a workshop for 2018 then do email me nic@rockleyfarm.co.uk with details of where you are and numbers of horses/owners and lets see what we can do! Its been a good weekend for three of the four horses we have here for rehab at the moment, as three of them are now landing heel first. They all arrived landing toe first, at least on their lamest legs, so this is a good achievement and importantly means that they are now able to graduate to working on tougher surfaces. This is a big help as more mileage and harder surfaces means more stimulation for the feet which means more healing and faster growth, all of which are important if horses are to go home after 12 weeks back in proper work. However one of the four is still landing toe first. She had particularly weak feet and under-developed palmar hooves so we are all hoping that a bit of extra time will help her get the landing she needs. These are Dolly's 4 week comparison photos and frustratingly she has not really made as much progress as I would have hoped. There are some improvements to her frog but it has not been sufficient to enable her to land better and she is still toe first on a hard surface. You can see from this angle that there are signs of her digital cushion and palmar hoof developing but the problem is that without a heel first landing she cannot work on surfaces like roads safely and this will slow her progress quite significantly. Slightly less under-run heels but this is again not enough to make a good landing comfortable for her. She certainly arrived with an incredibly poorly developed heels and frogs and they are stronger than they were but she is very far from having a healthy hoof. Finally we get to the last of the new rehab horses, Tabby. She arrived the same day as the other horses and was the only one to arrive in shoes. As is usually the case, the remedial shoes which were intended to provide support were not in fact, as supportive as her feet are on their own. Its also difficult for feet to remain balanced in shoes, as this photo shows clearly, since her foot has better balance once out of shoes and the lateral side is already less distorted. There are 3 photos here as the middle one shows her feet immediately out of shoes, since the pads were completely masking her frogs in shoes. Her toe looks a little long but that is old hoof capsule will quickly grow out as her palmar hoof becomes stronger. Again, a foot which is in fact less under-run and more supported out of shoes. The foot is also regaining a more normal shape which is great to see.